What's the difference between yesteryear and today? The logic of the argument for those calling for stricter gun control laws, in the wake of recent school shootings, is that something has happened to guns. Guns have behaved more poorly and become evil. Guns themselves are the problem. The job for those of us who are 65 or older is to relay the fact that guns were more available and less controlled in years past, when there was far less mayhem. Something else is the problem. Guns haven't changed. People have changed. Behavior that is accepted from today's young people was not accepted yesteryear. For those of us who are 65 or older, assaults on teachers were not routine as they are in some cities. For example, in Baltimore, an average of four teachers and staff members were assaulted each school day in 2010, and more than 300 school staff members filed workers' compensation claims in a year because of injuries received through assaults or altercations on the job. In Philadelphia, 690 teachers were assaulted in 2010, and in a five-year period, 4,000 were. In that city's schools, according to The Philadelphia Inquirer, "on an average day 25 students, teachers, or other staff members were beaten, robbed, sexually assaulted, or victims of other violent crimes. That doesn't even include thousands more who are extorted, threatened, or bullied in a school year." Yale University legal scholar John Lott argues that gun accessibility in our country has never been as restricted as it is now. Lott reports that until the 1960s, New York City public high schools had shooting clubs. 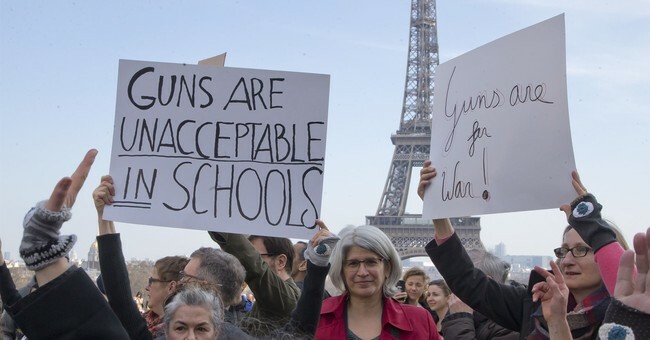 Students carried their rifles to school on the subway in the morning and then turned them over to their homeroom teacher or a gym teacher -- and that was mainly to keep them centrally stored and out of the way. Rifles were retrieved after school for target practice (http://tinyurl.com/yapuaehp). Virginia's rural areas had a long tradition of high school students going hunting in the morning before school, and they sometimes stored their guns in the trunks of their cars during the school day, parked on the school grounds. During earlier periods, people could simply walk into a hardware store and buy a rifle. Buying a rifle or pistol through a mail-order catalog -- such as Sears, Roebuck & Co.'s -- was easy. Often, a 12th or 14th birthday present was a shiny new .22-caliber rifle, given to a boy by his father. These facts of our history should confront us with a question: With greater accessibility to guns in the past, why wasn't there the kind of violence we see today, when there is much more restricted access to guns? There's another aspect of our response to mayhem. When a murderer uses a bomb, truck or car to kill people, we don't blame the bomb, truck or car. We don't call for control over the instrument of death. We seem to fully recognize that such objects are inanimate and incapable of acting on their own. We blame the perpetrator. However, when the murder is done using a gun, we do call for control over the inanimate instrument of death -- the gun. I smell a hidden anti-gun agenda.